Hi i am Red. I am Pinkie Pie Pyro's Host. Pinkie: "And i am Pinkie." We found something quite odd with how we interact with each other in the way of how Pinkie interacts with my body. What myself and Pinkie have isn't exactly just plain possession or merging or switching. Pinkie: "We both control the body at the same time without having to hinder another's senses/control with the body." exactly. what i see, she sees, at the same time. we still get feedback from senses even if we are not the one using that part of my body at the time. Pinkie: "Also this differs from regular possession because even though i have hooves and no hands i haven't needed to learn how to use Red's fingers because i use the same section of his brain that he uses to control his body"
The host can be asleep but the body and tulpa are awake so the tulpa is mostly in control. The body is like a separate entity to the host and tulpa. The body will side with the host than with the tulpa because the host has been in the body longer than the tulpa. 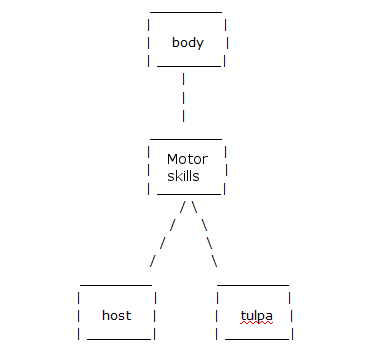 More control is given to the tulpa when the host is asleep. so what happens is sort of like using a Y splitter with audio cables. information feeds into the Y splitter and goes to both me and Pinkie. one way you can achieve mutual possession by starting with getting relaxed. then what you need to do is kind of "feed" the tulpa your senses. you can visualize this for example putting a tv in the wonderland showing what you can see IRL. the other way is to proxy back your senses to your tulpa. this method requires the tulpa to accept the sense and also for you to be able to direct what the sense is sensing towards the tulpa. One other way you could achieve mutual possession via proxying is to get very good with proxying the tulpa out to the world and have a little bit of parallel processing then you can just proxy back senses to your tulpa. what you are effectively trying to do is to give your tulpa access to your senses and body while still having access to that sense/body part at the same time. which is why having parallel processing is important when trying this. From what me and Pinkie have been through mutual possession doesn't take much once you get the hang of it. So we both react to stimuli at the same time but we don't block out each other from stimuli. Pinkie: "We hope that we wrote this well enough for others to understand and hopefully also start to do mutual possession too! :3"
EDIT: Pinkie: "This kind of thing is more so to do with how tulpa and host interact and how the tulpa talks out to the host's body." (05-29-2013, 04:31 AM)Phi Wrote: You said that you both control the body at the same time. What happens when one of you tries to move left and the other tries to move right at the same time? I sometimes get kinda close to that situation with Lyra. For the most part when we co-control, she just pushes along the same way as my own intention is going. This feels like I'm still doing the action at least partway, but it takes less intention and feels more like it's moving on its own; still the movements follow my will and I know what they're going to do before they do them. If I'm proxying her, I feel like I'm typing what she's saying, and sometimes I get the same feeling that she's helping with the movements. However if I mishear her or otherwise type something other than what she's trying to say, it becomes more difficult. I can do it since I still have stronger will than her, but it isn't as easy as when she's contributing to my movements or when I'm typing alone. The effect is that I type slower, feel more awkward, and make more mistakes. We're not quite to the point where I can just let go and have her movements run things completely. I feel like she needs to push her intentions a little harder, and more importantly, I need to get better at turning off my intentions without replacing them with an intention of no movement. Pinkie: "Please do note that this is called mutual possession and because it is mutual and possession, meaning yes this is half a possession guide that is trying to give a different symbolism while adding in an assisting factor. another addition to this is that the motor skills of the host are used as if it was a piece of electronics that did stuff to other things when you gave it input. an example you could use to sum up mutual possession is that it is like the body is a driver's ed car, there is a brake that the host can push when ever they need to to stop you from harming yourself and the host"
Pinkie: "I changed an image due to wording, i am unsure if i will have to change the wording in the guide to match or not, but for now i'll just change that." please leave any tips or feedback below! Pinkie: ":3"
Pinkie: "Also feel free to ask anything below!" You said that you both control the body at the same time. What happens when one of you tries to move left and the other tries to move right at the same time? but we kind of take turns with parts while the other has control over other parts of the body. err isn't all possession mutual possession? are you sure you aren't confusing possession with switching? i was under the impression that possession is just the host taking a backseat (but they can still control the body if they wish), while all stimuli is still shared. if i have misunderstood please let me know. also what is merging? Quote: we kind of take turns with parts while the other has control over other parts of the body. yeah this sounds like regular possession. again sorry if i have misunderstood. it is more so that both of us can interrupt each other and use my body when we need to. isn't proxying just typing out what your tulpa tells you? so wouldn't that be the exact opposite of possession? also what does parallel processing mean to you? i was under the impression that pp is just a background process that means you can have a separate stream of consciousness for your tulpa. it is not a conscious action is it? isn't it just sentience for a tulpa? also again, what is merging? sorry for all these questions, it just seems like none of this makes sense. if i have made a mistake somewhere please inform me. i see thank you for answering my questions to the best of your ability, i'll talk to card to understand more. It sounds to me like your either proxying or doing an unreasonably complicated switching in which you give control of each body part to whoever wants to use it at any given time, and they keep control until the other person wants to use it.